Whenever someone mentions the word “festival”, several images come instantly into my mind. For example, “music” as in: different kinds of music; “people” as in: lots of people; “volume” as in: connected with and related to aforementioned music and people; “beer” as in: countless litres of the stuff flowing freely from many designated areas; “mud” as in: the squidgy browny-black stuff that is usually the result of lots of rain falling onto a grassy area that could perhaps have been described as a field in another life. Yep, the 34th Bospop gathering had the lot! I honestly can’t imagine the logistics of organising a festival on the scale of Bospop without additional incidentals like re-locating to a new site, the World Cup Finals coinciding date-wise with the event or worse still, The Lord of the Sky having a tizzy fit that saturated most of northern Europe for days on end prior to the festival. But now, with the benefit of hindsight, Bospop 2014 will certainly go down in history as being one of the most challenging for the organisers at least as far as the weather was concerned… in truth, if it hadn’t been for the fact that the main spoken language on the site was Dutch, one could have been forgiven for thinking we were at Glastonbury… even the BYOB acronym took on a whole new meaning along the lines of: bring your own boat! Did any of this interfere with the success of the weekend? Not. In. The. Slightest. It was very much “business as usual” with the same high organisational standards that makes Bospop stand out from other festivals resulting in another fantastic weekend for all. Incidentally, there’s an old saying that goes along the lines of, “it’s not the weather that’s the problem, it’s the clothes you wear” and I totally believe that to be true. 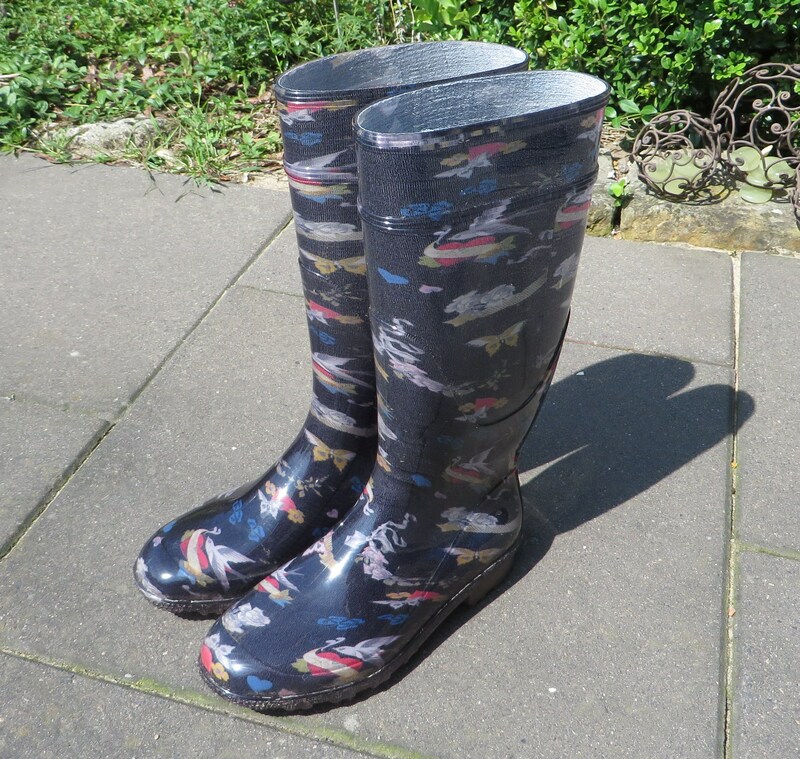 Hence, the official inauguration of my “festival wellies”, bought specially for such occasions and which indeed caught the attention of a certain Jim Kerr, I hasten to add… but more about that later. It might have been wet, wet, wet at times but my feet were dry, dry, dry!! Upon arrival at Bospop and entering the bar to meet up with some old friends, the barman and I started a quick-fire exchange of bands / song titles that reflected the weather conditions. “The River”, he quipped… “Have You Seen The Rain”, I threw back… “Muddy Waters”, said he… “Waterfront”, said I… at which point we both collapsed laughing and got on with the job in hand, i.e. sorting out my drink! As with previous years, the mini-army of some 2,500 volunteers were already in position and ready to rumble for what turned out to be a superb weekend of eclectic sounds that covered a multitude of genres that would appeal to everyone. This is something the Bospop management are particularly good at and it never fails to impress me how they always seem to get the music-mix just right. 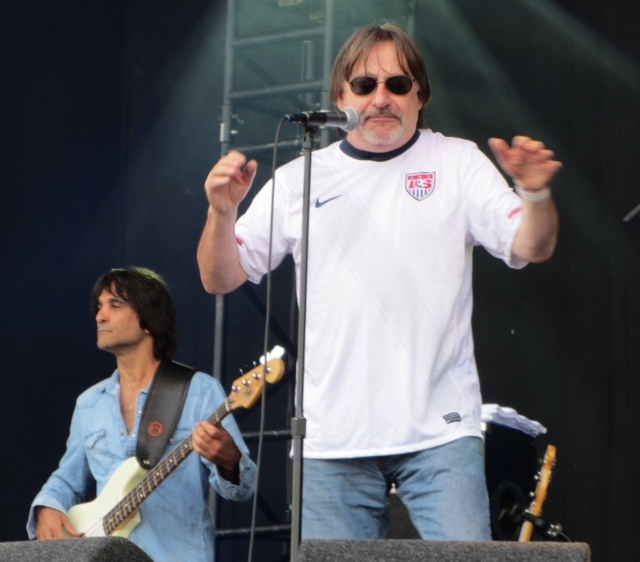 There was a slight déjà vu element about Bospop 2014 for me because… my first experience of this festival was in 2010 and the main reason for being there was because of Southside Johnny and the Asbury Jukes who were back to re-run the fun albeit on the main stage this time. John Fogerty was another name from 2010 and I can’t honestly say if his appearance had anything to do with the weather but I do recall his show opening with “Who’ll Stop The Rain” four years ago…! As with previous years, it’s just not possible to see all of the bands on the programme so I’ll take you on a muddy walk through my personal highlights and direct you to YouTube for everything else – a clear and welcome technological sign of the times. The Straits featuring Alan Clark and Chris White from the original Dire Straits band. 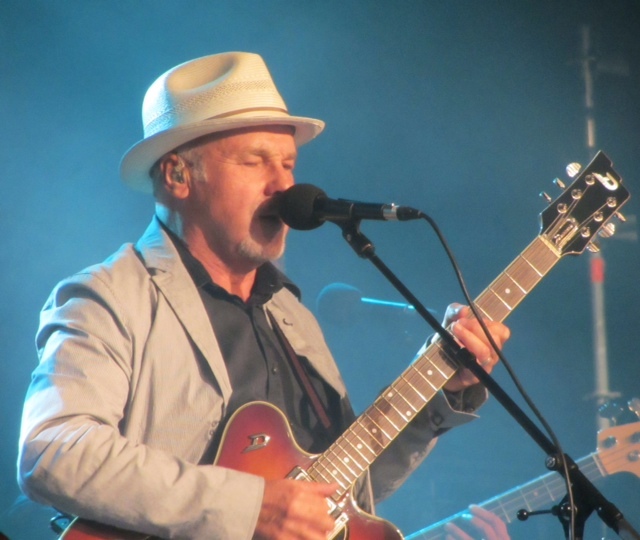 I’ve been a Dire Straits fan for the longest time and I guess like a lot of people, couldn’t really imagine hearing the music being performed without Mark Knopfler, a sentiment that Alan Clark also expresses on The Straits’ website. Having said that, I was however, quietly blown away (nothing to do with the weather I hasten to add!) by the outstanding quality of the line up that has evolved into The Straits and I thoroughly enjoyed hearing some of my favourite songs like, Romeo and Juliet, Sultans of Swing and Walk of Life. I loved the arrangements and of course I was transported back to my first Dire Straits concert at the NEC in Birmingham in 1985 – that was me standing 3 rows from the roof dancing to Walk of Life btw! Sincere thanks to Alan Clark for allowing me to publish the photograph below and I’m looking forward to seeing The Straits again hopefully in the not-too-distant-future. Kovacs (Sharon) an incredibly gifted, up-and-coming Dutch female artist aka, “The Voice of Eindhoven”. Sharon simply oozes musical prowess, something that has already been noticed and picked up by producer, Oscar Holleman whose name is connected with another Sharon, as in: “den Adel” – the hugely talented front-woman from Within Temptation. Sharon Kovacs looks a little like Sinead O’Connor and sounds a little like Shirley Bassey and I would hazard a guess that she is teetering on the edge of a springboard that will catapult her towards a phenomenal career in music – watch this space. Hailing from their namesake beach in California, Venice brought their trademark harmonies as well as their unique mix of soft rock / soul/folk and easy-on-a-Saturday-afternoon sounds to the Bospop main stage. A band that has had a successful relationship with The Netherlands for many years, Venice’s performance was like watching the sun breaking through the dark clouds that hung overhead but then, when the surname of all the band members happens to be, “Lennon”, perhaps we shouldn’t be too surprised! Venice has a great new album that is very definitely worth checking out, What Summer Brings… cool sounds, cool band, cool drink of your own choice to accompany the listening experience. Bløf. Now this is a name that was being bounced around a lot while I was speaking to different members of the Bospop Team. New to me, but a hugely successful 4 piece home-grown group that has been around since 1992 and who commanded the main stage with a fabulous set that included their cover of “Zo Still”, a song written originally by the German band, Jupiter Jones which they released as “Still”. Bløf‘s version was so good to be honest, I couldn’t tell the difference and until I researched this and realised that I hadn’t actually been listening to Bløf on German radio! Here is yet another example of the wealth of musical talent that exists in The Netherlands and which is just so great to discover at festivals like, Bospop. Sploshing across to the tent stage, Mike Peters was already in place for his rocking 60-minute Alarm / Declaration set. Mike’s last appearance at Bospop was in 2003 when he had the other Alarm band members with him. However this year, he did an astounding one-man version of the songs that made Declaration such a massive global success. 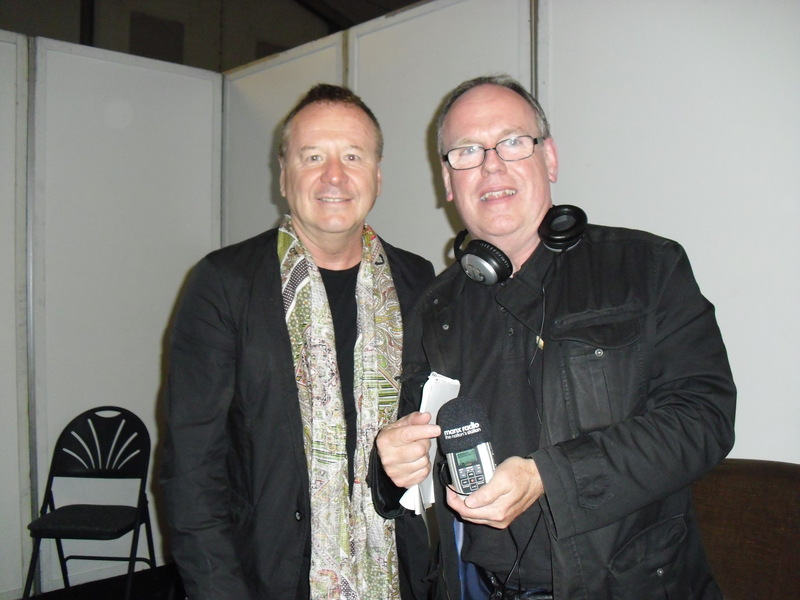 Prior to Bospop, Mike spoke to Manx Radio’s Greatest Hits Show presenter, Marc Tyley, the results of which you can listen to below. In addition, if you are not aware of Mike’s present health situation, I urge you to check out his own website as well as that of his rock and roll cancer foundation: Love, Hope, Strength for up to date news of all his current plans and projects. Mike Peters… a man with a powerful mission statement: saving lives, one concert at a time. Slight pause in musical proceedings here to report on the World Cup game that would decide Third Place between The Netherlands and Brazil… the home team won by a stomping 3:0 victory. Hup Holland Hup! In my role as Marc’s “guest producer”, I made my radio debut with one of my own questions for Jim and even now, his comment about my wellies is still ringing in my ears… let’s just say Jim’s accompanying look spoke volumes!! As the deep, reverberating bass lines kicked-in to open “Waterfront” and the stage lights flashed brightly in synch with the beat, the real world went on hold as the band blasted their way through a stunning and powerful set that hung in the air long after the last note was sung. Broken Glass Park, Love Song, Promised You A Miracle, See The Lights, Don’t You (Forget About Me), Alive and Kicking, Sanctify Yourself made up half of the pure dead brilliant 16-song set and the band’s third Bospop appearance… sensational stuff and simply the perfect way to end the day. The Lord of The Sky still wasn’t in the greatest of moods apparently but I have to say, I really enjoyed sloshing around in my wellies! 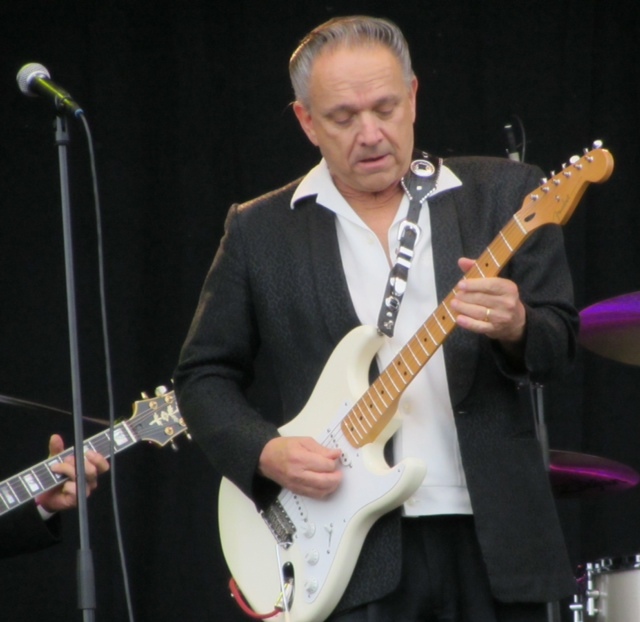 Guitar virtuoso, Jimmie Vaughan, as in the older brother of the late, Stevie Ray Vaughan as well as being a founding member of The Fabulous Thunderbirds, brought his Tilt-A-Whirl band to Bospop’s main stage delighting the crowds with their mix of electric blues / rock. Such a treat to hear this calibre of musicianship and a great start to another ab-fab day of sounds. While getting into position for the highlight of my afternoon – that would be Southside Johnny and the Asbury Jukes – I became aware of the strains of “Here I Go Again” filtering from the tent stage. Hä? Whitesnake? 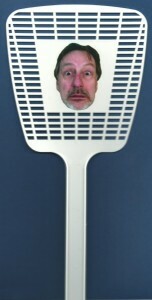 At Bospop? No, it wasn’t Whitesnake per se but it was former 80s Whitesnake guitarist, Adrian Vandenberg’s Moonkings delivering one of the all-time classic rock anthems ever written. Fabulous. 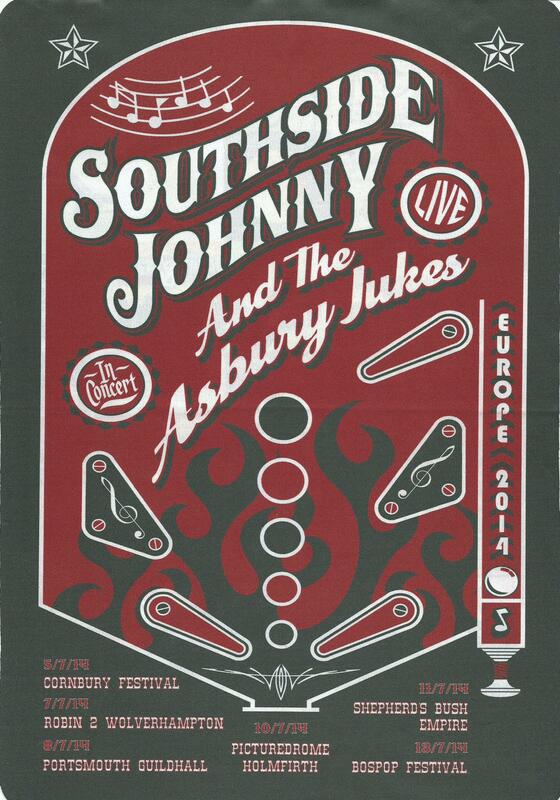 Heeeeeeeeeeere’s… SOUTHSIDE JOHNNY & THE ASBURY JUKES! Bright-eyed, bushy-tailed and fresh from a cross-channel ferry trip from England where they had been playing with Gary U S Bonds and British rockers, Albany Down (and yes that is Donna holding the drum sticks! ), Southside Johnny and the band comprising from stage left: Jeff Kazee, John Conte, Tom Seguso, John Isley, Chris Anderson, Neal Pawley and Glenn Alexander (ably supported by Hood and Joe Prinzo) hit the stage running with a 60 minute set of absolute Jukes magic that began with: This Time It’s For Real and raced through: I Played The Fool, Cross That Line, Without Love, Walk Away Renee, Angel Eyes, Forever, Princess of Little Italy, Talk To Me, Love On The Wrong Side of Town, Working Too Hard, I Don’t Want To Go Home and Shake ‘em Down… phew… get that!! 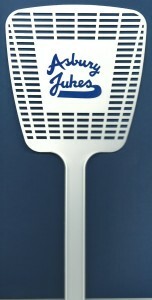 And by way of a bonus, even the sun came out – could it be that the Lord of the Sky is a Jukes fan??!! 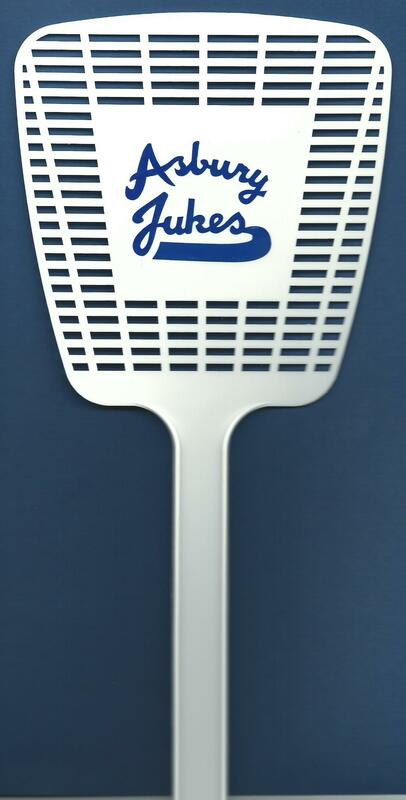 From my place in the pit, waving my newly acquired Asbury Jukes fly swatter (thank you, Carina) it was just great to see the greatest bar band in the world totally rock the main stage at Bospop 2014. Prior to Bospop, Southside Johnny took time out to speak to Marc Tyley by phone whereby a most interesting conversation developed, the results of which are below for your enjoyment. Next up on the main stage was Extreme who are currently on a world tour presenting the songs from their classic 1990 album, Extreme II: Pornograffitti. I don’t actually have this album in my collection but for sure, the song that stands out from the rest is, More Than Words and I guess this is what the Bospop crowd had been waiting for. Featuring the collective unplugged talents of Gary Cherone and Nuno Bettencourt together with the Bospop crowd as their backing singers, the duo delivered a stunning version of their classic rock-ballad. The rest of the set was hard, heavy and as you would expect from a live performance of an album, oh-so reminiscent of the hey-day of the 90s music scene. Btw, did someone from the Extreme camp trip over the main sound cable or maybe it was just an extremely loud blast from the past?! 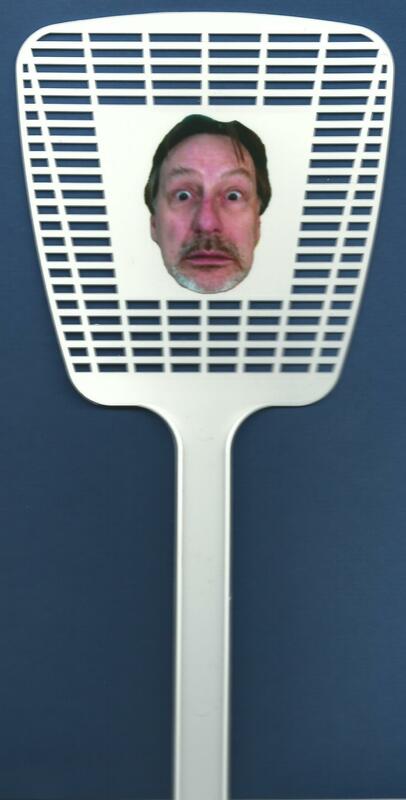 And the winner is….Triggerfinger! 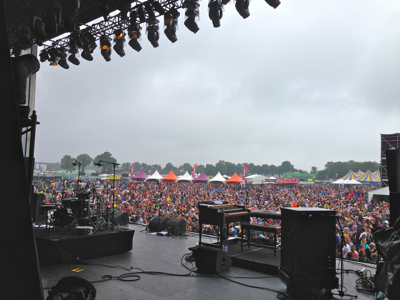 The Belgian trio won the Bospop prize for having the biggest downpour EVER accompany their set! The sky went eerily black as the clouds thickened and gathered above the main stage, the wind picked up slowly and… whoosh…down it came… with a vengeance… rain drops the size of guitar picks – someone told me the drummer was actually licking his drum kit during the performance and I’m not sure if that’s because he was thirsty or, merely trying to dry it off!! 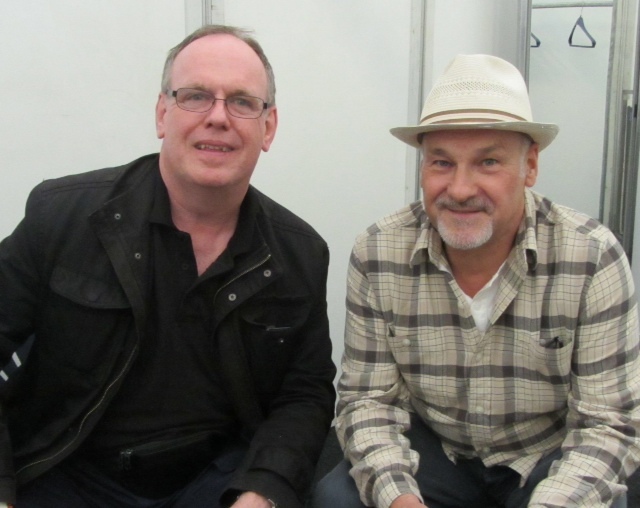 Paul Carrack was scheduled to play on the tent stage a fact that meant everyone would be sheltered. Having already played a gig the previous night at the Paradiso club in Amsterdam, Paul was more than looking forward to his Bospop set when Marc Tyley spoke to him shortly before show time. The interview includes a little bit of an insight about what it feels like to pick up the phone and find Eric Clapton on the other end requesting your musical talents. 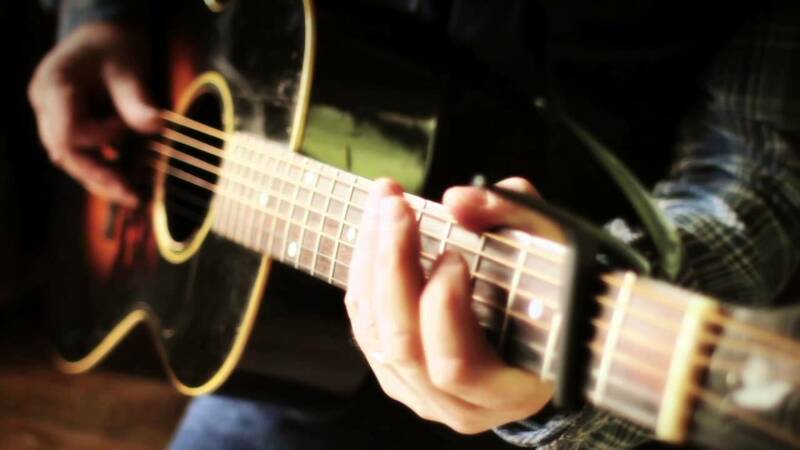 Paul also talks about his brand new, critically acclaimed album, Rain or Shine. The absolute highlight from Paul’s set for me was his wonderful cover of Bruce Springsteen’s, If I Should Fall Behind. Paul first sang this song as part of a BBC documentary about the history of the Titanic and it has since become part of his set-list. It’s a serious goosebumper and I am so glad that I had a chance to hear Paul’s beautiful arrangement. Oblivious to the football action that was taking place in Rio de Janiero between Germany and Argentina, John Fogerty, wearing his signature red-check, flannel shirt descended onto the main stage to bring Bospop 2014 to a resounding close. His 22-song set featured an impressive collection of Creedence Clearwater Revival’s greatest hits that began with: Hey Tonight and ran all the way through to my first ever favourite CCR song, Proud Mary. You really can’t fault John Fogerty, he is in a class of his own, does what he loves, loves what he does and quite honestly, long may he rock. A tremendous way to end Bospop #34. 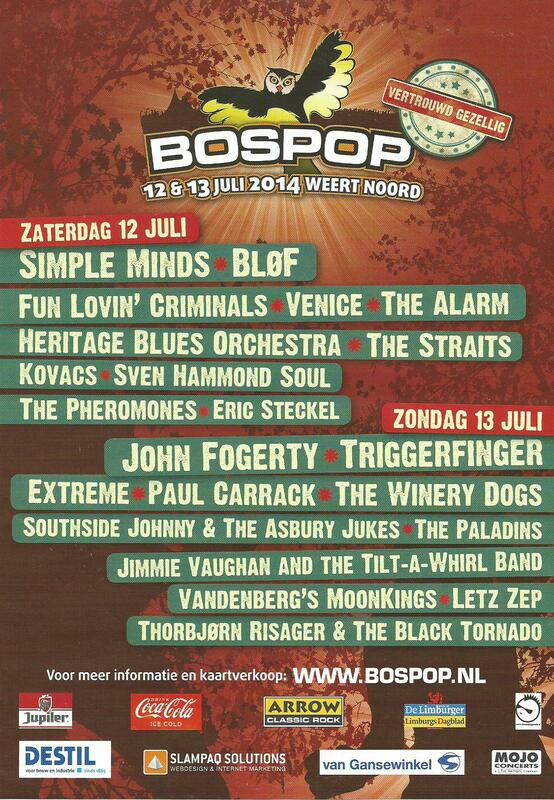 I am looking forward very much to Bospop #35 already and btw… back when Bospop 2014 was but at the planning stage, a “who-is-on-your-Bospop-wish-list” question went round Facebook… I had Southside Johnny and Simple Minds on mine… wonder what Bruce Springsteen is doing next July 11th and 12th ??!! Thank you: Marc Tyley for letting me loose on the end of a real, live microphone, also for sharing your photographs above. The Bospop Team comprising Koen Klomp, Roger Brouns, and Frans Bongers for their amazing and much appreciated on and off site support. Leon Deelen for keeping the bars running – apparently sales of beer were down slightly on last year but sales of coffee were very definitely up! One final PS: the picture that appears before my piece about Southside Johnny’s set is actually something called a “Manky”, the brainchild of Bill Peters who came up with this original idea. It’s basically an indestructible polishing cloth that is suitable for guitars, saxophones, glasses even phones and tablets… way to go, Bill… I love your idea! C-ya @ Bospop 2015!